We humans, intriguing, bizarre critters that we are, certainly exhibit some bizarre behaviour. If there is intelligent life out there in the universe, they must be scratching their bald heads at what they see. So for the benefit of our universe-commuting, almond-eyed, enlightened friends, here’s 13 things you absolutely must know about the Church of Jesus Christ of Latter-day Saints (LDS). Please, Mr Spaceman, don’t blow us up. Let’s get ready for Zion! Founder and self proclaimed prophet Joseph Smith Jr told his followers that Jesus was coming back and to get busy building Zion. Apparently, Jesus wasn’t too keen on returning to Palestine, deciding instead upon Jackson County, Missouri. Jackson County residents, not overjoyed by the idea of Smith Jr’s clan moving in, whether invited by the Son Of God or not, formed a militia which forced the group to move on to Clay County in 1833, where they were expelled five years later. Why is it people associated with the SoG always seem to have trouble finding a place to stay? Disguised as Native Americans, a Mormon militia known as the Nauvoo Legion attacked an emigrant wagon train in Mountain Meadows, southern Utah. After a bogus cease fire, the Legion promised the now starving, thirsty immigrants food and water. Once clear of the hastily built camp, militiamen, hiding nearby, executed 120 emigrant men, women and children, leaving their bodies in crudely dug shallow graves. In June 1844, Joseph Smith Jr and his brother Hyrum were taken into custody for treason. They were tracked down by an angry mob with blackened faces, who proceeded to storm the unsecured jailhouse where Smith Jr and his brother were being detained. After witnessing Hyrum get his face shot off, Smith Jr attempted to flee via a nearby window. He was summarily shot over and over by gunmen; presumably, just to be sure he wasn’t about to resurrect himself. Forget speed dating, when it comes to getting laid you could’ve done worse than join the Mormon Church in the latter part of the 19th century. Prior to the termination of polygamy in 1890, you could’ve amassed an impressive harem of god fearing women who would happily have bore you multiple offspring, even into the afterlife. The mormons have a definite edge when it comes to eternity. Not content with one heaven, you could, as a Mormon, end up in one of three sublime, and less sublime, storeys. The upper deck being, of course, the premium option, whilst the middle is, presumably, ‘economy’ class and the lower reserved for those who have strayed from the path and ‘embraced vice’. I’m guessing the basement gets pretty crowded. 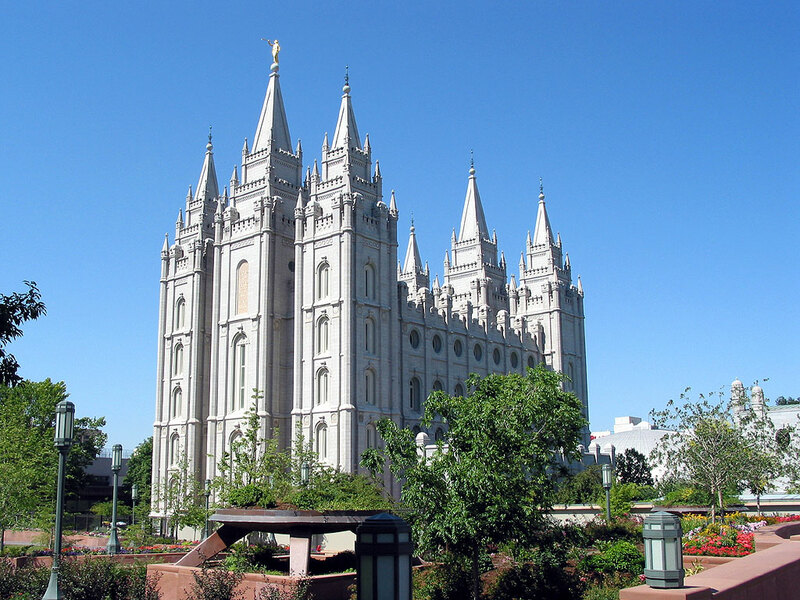 Recent estimates put the LDS up there with some of the wealthiest churches on the planet. Some commentators estimate that it’s richer than the Church of England, with an estimated annual revenue of 6 billion dollars and overall assets reaching as high as 30 billion. Righteous bucks. The scriptures indicate that a rainbow in the sky is a sign that the SoG won’t show that day. Jesus will return, instead, when the world is embroiled in an all out war, the smoke clogs the skies and rivers run with blood; swooping in like a superhero, He will save his followers at the last minute. I’d have thought that the smoke and bloody rivers were a greater indication that the herd might be in need of a little salvation, but what do I know? A description in the book of mormon details the struggle between two seemingly fictitious races, the Lamanites and Nephites. Portrayed as the dark skinned, wicked enemy of the lighter skinned, righteous Nephites, the Lamanites were cursed with black skin (thought to refer to Native Americans or Polynesians) to make them unappealing to the true followers of Christ. The text, perhaps thought too provocative, was changed by the LDS…in 2010. To repair gender equality in the LDS, feminist members took part in a ‘wear pants to church day’. In a religion seen as largely patriarchal, women report feeling pressure to dress traditionally. No real statement was given on ‘wear pants to church day’ by the LDS, but, based on comments from female members who say they feel obliged to wear skirts, you can assume that the old boys in charge much prefer to see a bit of leg when they’re worshipping the Almighty. Mormons are well known for their baby making abilities. In a 2012 survey, Mormons were 12 per cent higher than the national US average to have three or more children in the home. But it doesn’t end there. Couples whose marriages are ‘sealed’ in a temple, may continue to procreate in the afterlife and conceive ‘spirit children’. Fine, if you’ve not seen ‘The Shining’. Like latter-day survivalists, the LDS owns a gigantic facility called the Utah Bishop Central Warehouse. The facility is filled with seemingly endless rows of large-scale shelves stacked high with pallets of food. The church says the food is to help followers who have fallen upon hard times, whilst others speculate that the real function is to prepare for the disaster that Super Jesus will rescue them from. Presumably, he’s not bringing a boxed lunch with him. Another bizarre bit of scripture is the imposition of a kind of celestial curfew. The actual wording reads, ‘the holy ghost goes to bed at midnight’. Interpretations could be: either stay out, becoming a victim of Satan, or get to bed when the holy ghost does. Has anyone asked why a ghost needs sleep? Surely if it snoozed, wouldn’t Satan break in and steal all its candy? ” Recent estimates put the LDS up there with some of the wealthiest churches on the planet” – that is a strong fact since most churches have money. The Mormon church, very mysterious, even after reading through these facts. Army of the Lord = this just makes me say “WTF”. LOL. Such weird things that church is known for, but who am I to judge? Wow, three classes of heaven! That is some deep sh*t, LOL.